One day while browsing at my local hobby shop, I spotted this kit and decided that I had to have it. After plunking down my money, I happily left the store, went home, and opened the box. Yes . . . I actually waited until I got home to open the box! The kit is molded in light gray styrene and has raised panel lines. Overall detail on the kit is pretty good, with only some minor flash around a couple of parts. Details include a full cockpit, but only a standing pilot figure. Modifications could easily be done to another 1:72 scale figure if a seated figure is desired. Also included is the aft two-wheeled dolly used to move the aircraft around on the ground. The kit also has the nose landing gear, but, while the aft landing skids are included, Revell didn't include any struts to pose the skids in the landing configuration. Brass rod could probably be used to make the skid struts if desired. Revell also included a two-piece stand that is inserted into the afterburner. 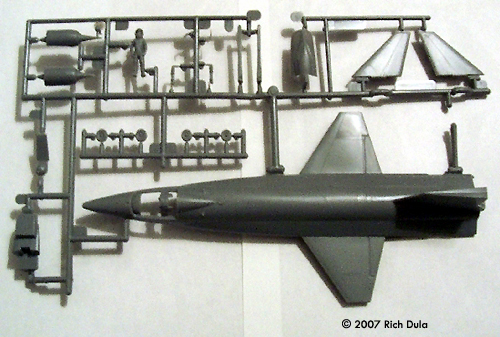 This kit represents the X-15-A-2. This is the aircraft that is on display at the US Air Force Museum. The A-2 version was rebuilt from aircraft number 2 following a crash landing in 1962, and featured a fuselage that was stretched from the standard length of 50.7 feet to 54 feet. The aircraft was fitted with a dummy scramjet that was attached below the lower fin. This scramjet is included in the kit, as are the dual external fuel tanks. The instructions are the stock Revell type, with 14 numbered steps, including detailed painting call-outs in the final step. The decals were printed on-register and were nice and sharp. Revell claims that the builder will have the ability to build two different versions of the aircraft, but this is not really true. 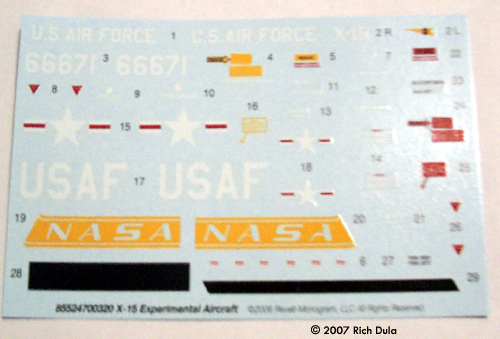 Revell has included decals for two versions, but in order to accurately portray a standard X-15, some modifications would have to be done. First, the builder would have to shorten the fuselage by approximately half an inch. I decided to check on the accuracy of the kit using Jimbob-Wan's Scale Conversion Calculator. 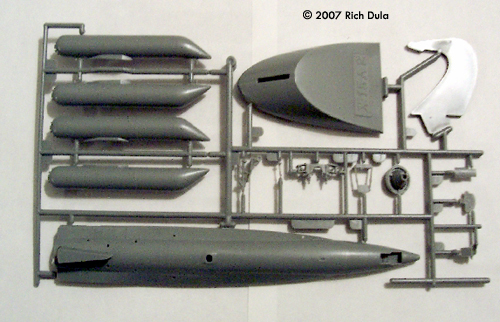 The correct length of a standard X-15 should be about 8.4 inches in 1:72 scale, while this kit measures 9 inches, reflecting the 1:1 scale A-2 length of 54 feet. Second, the canopy that is included in the kit is the canopy for the A-2 variant. This variant had a solid plate on the port side of the aircraft, and an oval window on the starboard side. The original X-15 had rectangular windows on both sides. Modeling the standard version would require cutting a rectangular opening on the port side, and widening the existing opening on the starboard side, then inserting scratchbuilt window panels. Finally, the stand that is included in the kit has a molded-on plate that says “X-15-A-2”. If the builder wants to use the stand with a regular X-15, this plate would have to be removed. I do like the kit, and I might end up picking up a second one so that I can build it as a standard X-15. More experienced modelers might want to remove the raised panel lines and re-scribe them to reflect the aerodynamic attributes of the original planes. Overall, it is a nice kit, with a limited number of pieces, that will look good sitting on your shelf. Many thanks to my Wonder Woman Coin Bank that I got from Bluesman for providing the review sample. Manufacturers and retailers, interested in getting your wares reviewed and publicized on a site averaging 3500+ readers a day? Contact us! This page copyright © 2007 Starship Modeler. First posted on 19 March 2007.